Rotogola can help in design for a Kitset Package to suit your needs. The following are our standard packages of under 20 Square metres whereby Council consent is often not required however we do recommend you consult your local Authority to check if any permits are required? All pricing is Ex-Factory (Rotorua) and does not include freight costs which is to be arranged by the customer. However in some cases we can assist in delivery depending on distance? Design shape "meaning length and width" for the chosen square metre package will be agreed with the customer at the time of manufacture. Please note: The following photo's are general Rotogola photo's but do not relate to any specific package. 2 x Rotogola Unique 316/304 Stainless Steel Roof Brackets and 2 x 80 x 80 316 Rotogola Stainless Steel Posts @ 3mtrs. 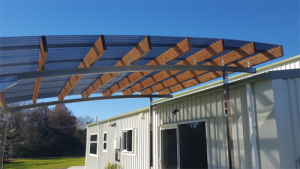 ( or 4 x Posts if our Rotogola Unique Roof Brackets are not being used for free standing units). Note: additional costs apply for posts longer than 3 mtrs. Note: There is an option for 100x100 posts and 400grit polished Posts at an additional cost. 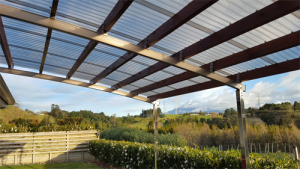 Rotogola custom made Stainless Steel Rotogola clamping purlin bracket sets. 145 (or 195) x 45 H3.2 KD (kiln dried) SG8 (Structural Grade) Rafters. Laserlite 2000+ Premium corrugated or Greca Polycarbonate 99.9% UV protection roofing , choice of tint. Alsynite Multipurpose expansion fasteners and anti-squeak tape. Allen Head Cap Screw 316 Stainless steel bolts with stainless Dome nuts for all fixings in stainless components and for Rafters. Holesaw drill for holes to be drilled at each end of bearer beam. Cutting discs to trim ends of bearer. Instruction Manual for erecting the Rotogola Kitset. Additional to this cost is your builders labour and materials inc concrete to erect the structure plus roofing uplift and refit labour (only required with roof bracket fitment). 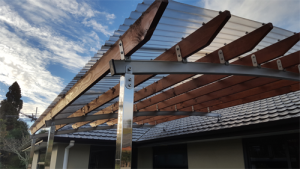 We will guide your builder or yourself as the home handyman in how to erect this simple but strong Unique Rotogola System. 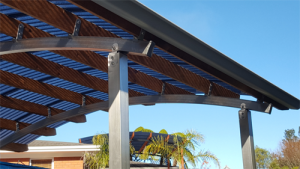 Note: If your property is steel framed you will need advice from your builder/architect and or engineer to fit our Rotogola roof brackets as timber may require adding in these situations. Also additional to this Rotogola kitset module cost is gutter and drainage and any council drawings and associated permit costs if required? however this will be left up to you and/or your builder to pursue if you wish? In addition to these costs is the staining and cutting of the Rafters. Usually cut by the builder and possibly stained by the customer or builder/painter of your choice? To make your purchase simply fill out the Order Form below with the required details and push Send Order. For Rotogola purchases once we have received your order we will email you an invoice with the details required to confirm your order. Please use your name and our reference number given to you when making your payment. If paying by electronic banking please allow at least two working days for your internet bank transfers to appear in our account before your order will be confirmed. If paying by cheque allow three working days for your cheque to clear before your order will be confirmed. We will confirm by email receipt of your payment. You will be contacted a few days before your Rotogola kitset is ready for pick up or you may require us to arrange the drop off or a transport company if required. Note: You will need to arrange your own insurance for transportation. We do a full wrap on all our Rotogola Components for transportation, please inspect the product at the time of the delivery if you see evidence that the packaging has been damaged then open, inspect and re-wrap , otherwise we recommend leaving the product in the packaging until the time of erecting to keep the product safe. If you are going to put the product into storage and it has been un-packaged then please store carefully and not against each other or foreign items so as not to mark them. Please Note: You must "Accept Terms of Trade" before your order can be submitted.